The merits of state intervention in economic affairs as opposed to the self-organizing virtue of the free market have been a theme of debate among economists ever since economic affairs became an autonomous discipline. 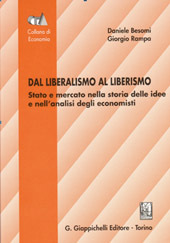 From the mercantilists to the classical economists, from the neo-classical schools to Keynes, from the Keynesians to the contemporary resurgence of laissez-faire, the perception of the relationship between state and market forces (and the resulting implications on economic policy making) underwent several radical changes in the last three centuries. Nevertheless, contemporary economists and policy-makers alike seem to feel the need to refer back to the view of the classical economists to justify their propositions: the 'invisible hand' is called upon to guarantee the existence of a mechanism capable of bringing about the best of all possible worlds, and Adam Smith ties have been decorating the necks of a number of presidential advisors. This supposed direct line of descent from classical political economy to contemporary economics is however a myth, which is not founded on historical evidence nor on analytical grounds. This volume investigates both these aspects. The first part examines how these problems were dealt with by different authors or schools of thought, from the early mercantilists to the 1950s. This historical account shows that extreme laissez-faire was an exception rather than a rule, while most economists were rather cautious in limiting the role of the state. The second part focuses instead on some specific analytical aspects of the problem, showing that the language and the conceptual instruments used by contemporary economists themselves contradict the laissez-faire interpretations of contemporary neo-classical economics.